The town of Middleboro' has had considerable difficulty in getting a chemical fire engine. After considerable delay it was shipped, but went astray in transportation and had to be looked up. Finally it arrived but was unaccompanied by necessary equipment, so at present it is entirely useless. [Old Colony Memorial, November 30, 1882, p. 4]. Apparently by the time the above photograph was taken of Middleborough Chemical Engine No. 1 outside the Middleborough railroad depot, the necessary equipment had been located and put to use. 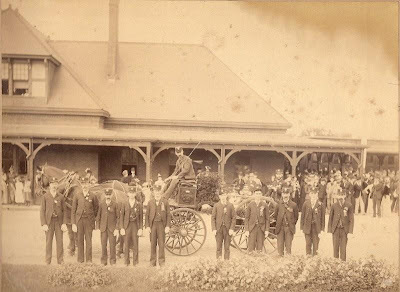 Chemical Fire Engine Company, photograph, late 19th century. The company depicted includes (standing left to right): E. F. Doherty, John J. Walsh, Thomas Curley, James E. Murphy, Seth Holmes, James Curley, Michael Leahy, Timothy Creedon, William J. Taylor and John M. Luippold. Ira Tinkham is seated at the front of the engine and Henry D. Smith at the rear.